Get answers to questions about your stay at The Eco Camp. All of the tents at The Eco Camp are treated with an inside and outside waterproofing treatment that gets refreshed at the start of each season. Rest assured, we wouldn't furnish the tents if we expected them to leak. How much space is in your tents? Our 16-foot tents can accommodate up to 4 persons (2 adults, 2 children). They have a floor area of about 200 square feet. The Eco Camp provides bedding for our queen beds. Children stay on provided cots and need to bring a sleeping bag. Our bedding is not intended to be used by guests as bedding for their dog. All of our pillows and mattresses have bed bug proof covers. Will there be bugs in the tent? Our goal is to provide you a tent that has no bugs in it. However, you are camping, in a tent, in the forest. It is prudent to assume that you will encounter bugs - inside your tent as well as outside. Guests are not permitted to spray insecticides (Raid, OFF!, or similar) in the tents as they damage the natural cotton canvas of our tents. What makes The Eco Camp eco-friendly? 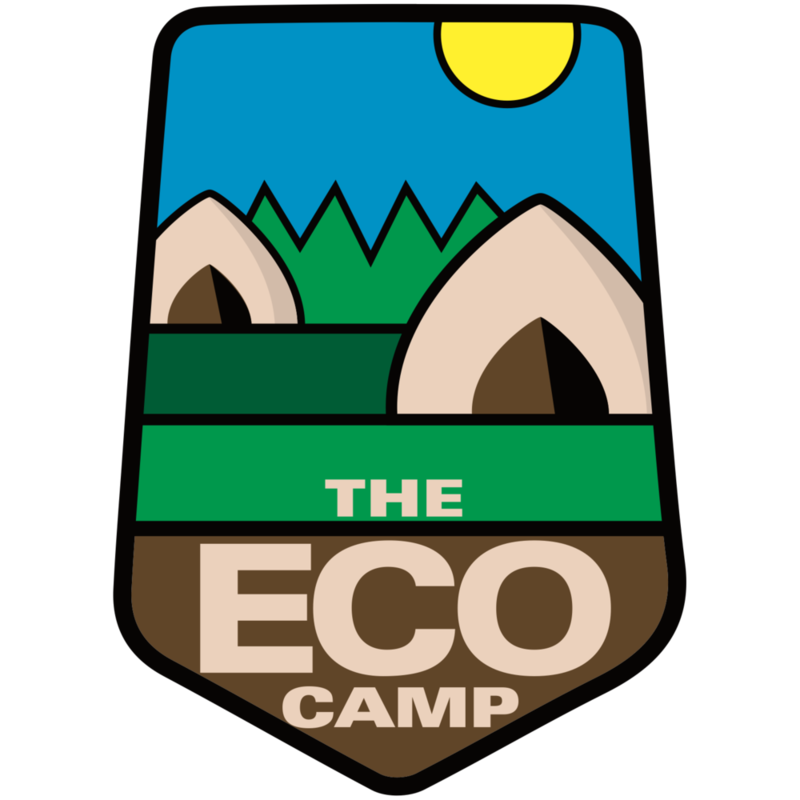 The Eco Camp follows Leave No Trace - we aim to have minimal impact on the environment. We are working towards achieving sustainable standards in all aspects of our business. Our tents are made of natural canvas instead of petroleum-based fabrics. They are breathable and comfortable, even when it gets a bit warm outside. No live trees were cut to create our campsites. All on-site operations are solar-powered. From our vacuum cleaner to the morning coffee - the Airstream Office is supplied by solar power. Instead of propane grills, we encourage the use of our community fire ring for cooking. All wood for the fire ring comes right from the 15-acre property. Fold and place all bedding on the bed. We wash all bedding after each guest. Do not leave bedding on the floor. Clean leaves and debris off the floor. Remove all trash and dirt from the floor and tent and place it in the outside trash can. Wash all dishes used by you and your party. Clean the outside tent area of all trash and debris left by you or your party. Text the camp host that you are ready to check out. When you are ready to check out, please text management and a staff member will complete the checkout list with you. Dirty tents make extra work for us. We reserve the right to charge for additional cleaning. How about the bathroom situation? The Eco Camp offers toilets (year-round) and a campground shower house (Spring, Summer, Fall) to campers. How can I cook at The Eco Camp? Each tent comes with a charcoal grill. We also provide glasses & cups, silverware, plates, and a cutting board. You can also choose to cook over the community fire ring in the center of The Eco Camp. Many cooking utensils are available in the Airstream Office. We have cast iron cookware on site, as well as pie irons, and hot dog campfire roasters. We typically make a campfire around 7 PM in the evening. What else can I do at The Eco Camp? We have a large social hall on the property with pool tables, arcades, and weekend entertainment from bands to cookouts. Our large natural swimming pond with floating deck is very popular with our guests who have been hiking and biking all day. What dining options are there in the area? Talk to Alex upon your arrival and he'll recommend some local favorites. Honestly, though, nothing beats a home cooked meal over the campfire. Is there a tour or guide book for your area? Yes, please download the 3rd edition of "Living in Oak Openings - A Guide to One of the World's Last Great Places". Can I bring my dog to The Eco Camp? Yes. We love dogs. Big Lotus 3 and Big Lotus 4 are our dog-friendly tents. No dogs permitted in the other tents. We permit one (1) dog in Big Lotus 3/4. Send us a message if you're thinking about bringing two really small dogs (Chihuahua-sized), we'll try to accommodate. There are squirrels and birds everywhere. Your dog will have a blast and your arms will be pulled by the leash. Skunks like to hike through the park at night. Be mindful as we do not stock enough tomato juice on site. Dogs must be leashed on the property at all times. There are no exceptions. You may never leave your dog alone in the tent or vehicle. Bring a crate for when you are in the shower, restroom or otherwise occupied. Never leave your puppy alone in the tent - they will unintentionally destroy the expensive tent. We speak from experience. Our tents are very expensive to repair and you do not want to be responsible for a repair bill. All poops must be picked up immediately and disposed of in a trash can. We reserve the right to demand that a dog be removed from the property due to aggressive, threatening, or menacing behavior. Excessive barking is also not permitted. (We know, try telling the doggie that.) Alex does not mind getting barked at - it's a sign that your pup has established their territory. You must clean up minor (#1) and major (#2) accidents in the tent right away. We are providing an organic cleaning product for your use. Spray on rag and wipe surface. Do not spray directly on the tent fabric. Let Alex know if an accident happened and where. We do not charge a cleaning fee for minor accidents. Major accidents and/or a chewed tent or chewed furnishings will incur charges. Do not permit strangers or other guests to approach or pet your dog. Protect your dog. Can I bring my cats, gecko, or pot-belly pig (among others) to The Eco Camp? Sorry, no. You know why. How about my pet possum? Sorry, same thing - Possum is probably better off at home. What is the mosquito situation like in Oak Openings? Mosquitos are part of life in this area of Ohio. Lucas County is responsible for mosquito remediation and treatment and they do a great job at containing this pesky, yet vital, part of our ecosystem. Bring long sleeved shirts and pants as well as mosquito repellant. Campers at The Eco Camp are not permitted to bring foggers or other large-area methods of insect eradication. Are there any other critters I need to be aware of? The Eco Camp is located just outside of Oak Openings Metropark. This region is biologically diverse and home to deer, badgers, raccoons, snakes, and spiders (among others). Camping in nature means trying to arrange one's expectations with nature in mind. You will encounter spiders and ants. Yes. The Oak Openings region is home to Poison Ivy and its variants. The Eco Camp takes every precaution to remove poison ivy from and around trails. Do not venture off trail. The Eco Camp is open year-round.